Some people say that Christians are judgmental. Actually, it is God who’s the Judge and Christians sometimes sound like the judging ones when trying to convey what’s presented in the Bible. Don’t reject the messenger, like people have done for centuries to God’s prophets, even the Messiah with his provocative lessons told through parables. A parable is a simple story with a deeper meaning. It’s a moral, spiritual truth told in everyday language and images. Jesus spoke and taught in parables to communicate in common terms so that people could understand. Nevertheless many heard these stories from Jesus but still did not understand. They remembered them though. And now they are in documented New Testament scriptures so we can study them and come to full understanding. There once was a gardener who tossed planting seeds all around the grounds. Some of the seeds fell on the walking path and were quickly snatched up and devoured by the birds. Other seeds fell on rocky ground where there was no depth of soil, so while some sprouts grew, they quickly withered away in the hot sun. Still other seeds fell upon the thorny weeds and soon were choked and smothered. 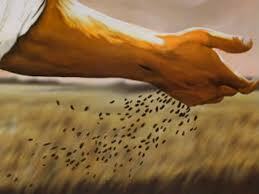 Finally other seeds actually fell on good soil where they took deep root and brought forth multiplied growth. 1. Hear It, but Don’t Really Believe It – Many have heard the Gospel message in sermons or through family and friends. Like seeds falling on an open path or on deaf ears, the message is plucked out of their minds and never has a chance. 2. Hear It, Believe It, but Don’t Feed It – Many hear the message of God and acknowledge its truth for their lives but never take another step toward development. There is small growth but then a withering away in their faith as they are not nourished or sustained. 3. Hear It, Believe It, Feed It, but Don’t Surrender to It – This is the category of many devout Christians, like myself for many years, where we believe and move through life with a balanced mix of godly faith and worldly pursuits and entanglements. The net result is immature fruit or no real fruit at all because God is relegated to lower levels of devotion. It’s unfortunately living the Christian life at less than 100% – see BV post Living at 80%. 4. Hear It, Believe It, Feed It, and Do Fully Surrender to It – This is the “‘all in” Christian. Not simply the go-to-church-on-Sunday-and-maybe-a-mid-week-Bible-study-meeting-Christian, this is the full-surrendering kind where God is nourishing daily in deep, rich soil that blossoms in fresh, multiplied fruit even a hundredfold. The Word of God is for all mankind. There are Life and Death implications to how we respond. Casual response is actually not acceptable, per the ultimate Judge. The message is clear, even as told in a simple story. Are you living and producing fruit in deep rich soil?